Event Horizon Telescope unveiled the first photo of a black hole in the center of the M87 galaxy. It is a very active supermassive black hole, located about 55 million light-years away from us. We estimate that its event horizon extends over a distance of 1.5 light-days. This very large diameter is due to its mass equivalent to 6.5 billion times the mass of the sun. The apparent radius is about 10 microseconds of arc. When you observe the Moon from the Earth’s ground, it has an angular diameter of half a degree, that is to say that the angle formed by these two edges and your eyes takes this value. In astronomy, we observe very small objects. The angular radius is often much less than 1 degree. Therefore, more precise units are used to describe these tiny angles. One minute of arc represents one sixtieth of degrees and one second of arc represents one sixtieth of a minute of arc. An object that makes an arc second appears tiny. However, it is still necessary to divide this angle by one hundred thousand to represent the radius of the central black hole of M87 seen from Earth. In comparison, the supermassive black hole in the center of the M87 galaxy appears to us tens of millions of times smaller than the Moon. This type of observation goes well beyond the capabilities of James Webb Telescope or even better optical interferometers. That is why it was necessary to create a huge radio interferometer whose base lines extend over thousands of kilometers. The Event Horizon Telescope has not really seen the supermassive black hole. Indeed, a black hole does not let any information escape. So there is literally nothing to see, neither in the optical field nor in the radio field. The immediate surroundings of a black hole are however very interesting and could never be observed directly. 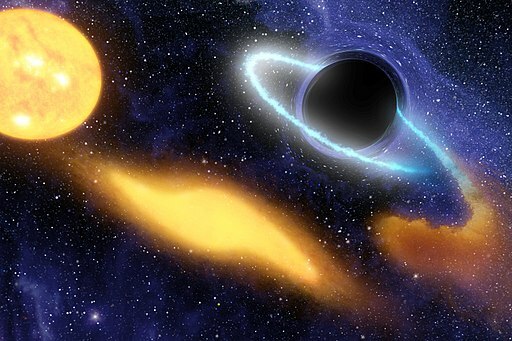 The physical phenomena that occur near the black holes have been imaged and simulated. This has generated the representations of black holes that can be seen in films like Interstellar. To create this Hollywood blockbuster, a team of thirty scientists worked for a year using thousands of computers. Their research and simulation work even resulted in a scientific publication. Even if in this movie the black hole has been modified compared to the results of the simulations, it is a good representation of what we would see if we were close to a black hole. Scientists working on the Event Horizon Telescope have developed other simulations based on Einstein’s general relativity, which is the theory that describes our understanding of space, time, and gravitation. The observations of the Event Horizon Telescope are also a test. The real interest of the project is to test the Einstein’s theory formulated more than 100 years ago in the most extreme conditions known. There is also a lot of information to collect in the supermassive black hole of the M87 galaxy, like the phenomena that generate its accretion disk. How to interpret this first image of a supermassive black hole ? The first image of a supermassive black hole may seem a little bland in comparison to the black hole of the movie Interstellar. It gives very important information. It confirms that black holes exist. We had evidence going in this direction, especially since the emergence of astronomy use of gravitational waves. Now, for sure, black holes exist. These objects predicted by physics for decades have finally been imaged. We are now also sure that the center of most galaxies is occupied by a supermassive black hole. The image of the supermassive black hole in the center of the M87 galaxy is exactly what we expected to see. The luminous ring, the accretion disk of the black hole, is composed of materials heated to millions of degrees by the extraordinary gravitational field of the black hole. These materials circulate around the black hole at a fraction of the speed of light. The lower part of this ring appears brighter than the upper part because the material circulating in the ring undergoes the Doppler effect. The moving part towards us is shifted towards blue and appears brighter, while the part that moves away from us is shifted towards red. This highlighting is therefore solely due to the position of the observer. The supermassive black hole accretion disk is probably homogeneous. In this image we see the central black hole of M87 from a position close to one of its poles. This is why we do not see the accretion disk crossing the shadow zone as in the famous black hole of the movie Interstellar. In the middle of this shadowy area is the events horizon, invisible. Its diameter is smaller than that of the central task. At the edge of it is the last stable orbit around the black hole. All the material that crosses this limit ends up dropping quite quickly towards the events horizon. It is a point of no return beyond which nothing can escape. The central black hole of M87 is absolutely gigantic. Our whole solar system could fit in its shadow zone. Sagittarius A*, the supermassive black hole of the Milky Way, is the other target of the Event Horizon Telescope. We could discover the first image of Sagittarius A* in the coming weeks or months. Unfortunately, it is not easy to organize the observations of the Event Horizon Telescope. The idea of ​​imaging the shadow of a black hole with very long baseline radio interferometry was formulated in 1999. It took twenty years of work to achieve this result, including two years only to process the data from the 2017 observation sequence. 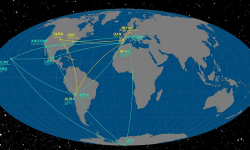 Since then, the eight radio telescopes of the project have not worked together again. Weather conditions were hard in 2018 and the 2019 observations had to be canceled due to technical difficulties. The good news is that the experiment will be tried again from 2020, with new observatories to complement those already in use, which should improve image resolution. Only supermassive black holes are bright enough to be imaged by such a device. M87 and Sagittarius A* will therefore still be prime targets. For over a century, the theory of general relativity has replaced the law of universal attraction in our understanding of gravity. In the vast majority of cases, the two theories make similar predictions. It is therefore possible to explain the movements of most celestial bodies using only Newtonian gravitation. But when the masses and speeds become too great, the relativistic effects have an impact. Only Einstein’s theory makes it possible to make correct predictions. For the moment, we have not succeeded in contradicting general relativity. This theory has even successfully passed a new test on July 27th. The predictions of the general relativity would be verified mainly in extreme environments, like that of a supermassive black hole. It is in any case the reflection of a consortium of researchers gathered around the Gravity experiment. In the center of our galaxy is an intense radio source called Sagittarius A*. It is precisely associated with a supermassive black hole. It is impossible to observe this black hole directly since the black holes do not allow any electromagnetic wave to escape. The Gravity consortium has therefore focused on the trajectory of a star in the immediate vicinity of the black hole, called S2. This star is a prisoner of the monstrous gravitational field of Sagittarius A* as it approaches closer to the supermassive black hole. Its orbital velocity reaches 8,000 kilometers per second, a speed sufficient to make the effects predicted by the theory of general relativity detectable. The huge mirrors of the Very Large Telescope (VLT) and their state-of-the-art instruments have therefore been used to track S2 with unprecedented precision. Einstein’s theory predicts that strong gravitational fields produce a shift towards the red of the light sources passing through it. This shift towards the red is due to the contraction of the lengths undergone by the objects in displacement. This contraction affects even the wavelengths and therefore the observed light. Such a shift towards the red of the gravitational field of a black hole had never been observed. This is now the case, the observation has conformed to the theory with the greatest precision. This experience further reinforces the theory of general relativity. This is obviously good news because one of the fundamental pillars of modern physics seems even more unshakable. But for some theoretical physicists, it is also a small disappointment because a very small flaw in the theory of general relativity could pave the way for new physics and new paradigms. But it is not today that Einstein’s relativity will be discussed. The Gravity consortium also measured the trajectory of the star S2, observations that have not yet been published. They should make it possible to better know the distribution of the mass near the black hole. It may be a chance to understand a little better what is happening in this extreme environment. It will also be an opportunity to compare these results with those of another project that also conducted observations of the immediate environment of the central black hole of the Milky Way. With a little luck, Sagittarius A* will reveal some of his secrets before the end of the year. The supermassive black holes have just been the subject of a fascinating and frightening study. These black holes are traditionally associated with the center of galaxies. We are not yet certain of the way in which they are created. Are they born in the youth of the universe or have they slowly formed by devouring the stars one after the other? Sagittarius A * is more than 25,000 light-years away from Earth, but in recent years we have realized that there are probably nomadic supermassive black holes. The first evidence came from the Chandra Space Telescope. Supermassive black holes appear to be fusions between galaxies. But this does not always result in black holes fusing, especially if there is a big mass difference between them. The least massive can orbit around the most massive. 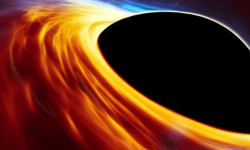 A new study published last month in the Astrophysical Journal Letters suggests that this type of black holes would actually be quite common, even within the Milky Way. The study is based on a simulation performed using a super-computer. 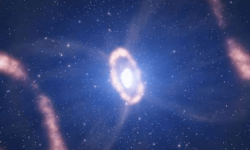 By reproducing galaxies with a mass close to the Milky Way, the calculations show on average a dozen supermassive black holes for each of these galaxies, regardless of the fusion history of the host galaxy. Sagittarius A * would have a dozen cousins ​​who travel in the Milky Way. But it seems that our solar system is not in danger because the authors of the study estimate that such black holes should approach our solar system on average every 100 billion years, almost ten times the age of the universe. If the Milky Way has so many supermassive black holes, why have not they ever seen them ? The team behind the study believes that this type of black hole would be quite far from the center of the galaxy. They may not surround themselves with a cloud of gas and would remain completely black. To see if the simulation is realistic, we will have to make observations in our galaxy or in another galaxy. These objects of several hundreds of thousands of solar masses must leave some traces that will eventually detect. It may be the opportunity to study the past of our galaxy and understand the events that allowed it to be created. But in the meantime we must already try to understand a little better Sagittarius A * because even if we can not see this supermassive black hole, at least we know where to look.